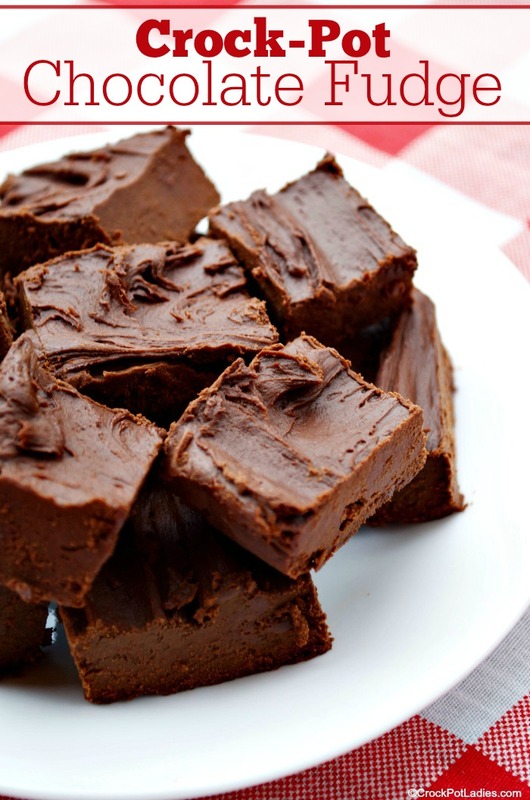 We love how easy this 2 ingredient recipe for Crock-Pot Chocolate Fudge comes together. This recipe is so simple that even a child could make it. 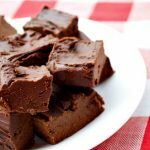 In fact the kids and I like to make several batches of this easy fudge for Christmas gift giving each year! Each year my family and I make about 100 batches of Christmas fudge. But this year I have been sick as a dog and really just did not have the energy to do one big day of cooking and slaving over a hot stove making batch after batch of traditional fudge. So instead of giving our friends, neighbors, teachers, etc fudge this year I opted for a few different homemade treats like candy bark, Chex Mix, etc. 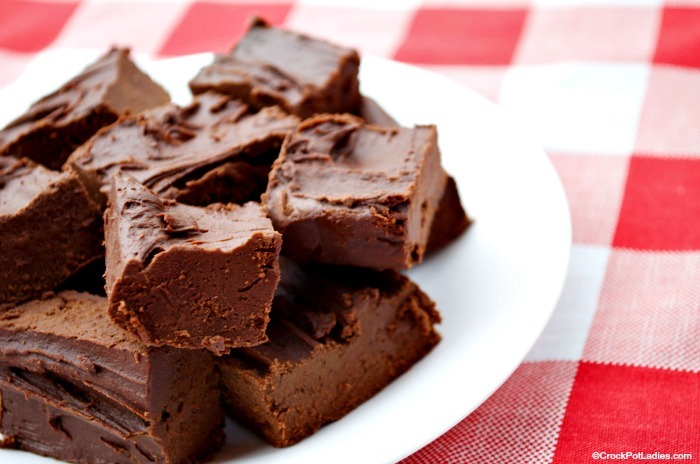 But I personally LOVE fudge and wanted to make at least one batch for us (OK OK me). So I turned to my crock-pot. I wanted this to be easy because it is the season for bronchitis and my energy is just sapped. This recipe could NOT get any easier folks. There are just two ingredients. Chocolate chips and a can of ready made store bought frosting. I used semi-sweet chocolate chips and a dark fudge chocolate frosting and the results are a VERY chocolaty fudge. I love chocolate so it suits my tastes just fine. However my 16 year old daughter though it was too much. You could make this with milk chocolate chips too if that is your thing. I had a bag of peppermint candies already on hand so I crushed them up in a zipper baggie and whacked them with my rolling pin. This was to sprinkle on top and add a little holiday flare. But you can totally omit that and just make plain fudge. Or you can top them with sprinkles or other candies. Two ingredients, about 1 hour cooking time and you have fudge. How could it get any easier than that? This easy to prepare chocolate fudge is perfect for any time you have a sweet tooth or need an easy recipe for gift giving. With only 2 ingredients and about an hour of cooking it could not get any easier! Scoop chocolate frosting into the bottom of a 3 quart slow cooker. Cover and cook on low for 1 to 1.5 hours. While chocolate mixture is cooking prepare an 8X8 inch baking pan by lining it with parchment or wax paper, leaving paper on each side overhanging. Once chocolate mixture is melted, stir well to make sure everything is well combined and all of the chocolate chips are melted. Pour into prepared pan and spread with an offset spatula. Sprinkle top with crushed peppermint candies, sprinkles or topping of your choice (optional) pressing topping lightly with hand to make sure it sticks to the fudge. Place pan in refrigerator and let cool 2 to 3 hours. Cut cooled fudge with a sharp knife and serve or package for gift giving. Topping options - crushed peppermint candies, sprinkles to match your holiday, nuts, dried fruit, chopped candy bars. Hi Heidi! I’m gonna try this recipe tomorrow for sure! I just wanted to ask if you’ve tried the crockpot liners. I think they’re wonderful, as I love to use my crockpot, but I hate clean-up. Hope you’re better & Merry Christmas. Hey Dana, thanks for dropping by and commenting. I hope you enjoy this recipe. I use crock-pot liners all the time and you can totally use them in this recipe. I just happened to be out of liners when I made this recipe. However, it did not stick at all. So if you don’t have a liner just an FYI this is one where the fudge just sort of slides right on out of the crock. 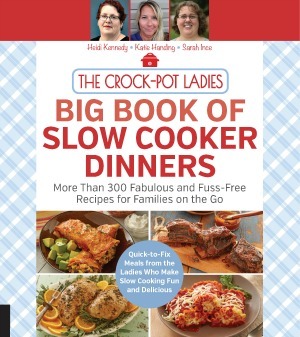 Why not just use a crockpot liner and then lift it out and sit it in the dish to chill the fudge? It should lift out just as easily after the refrigeration period and then popped out for cutting. Never thought of that, it should work! I will have to give it a try! Have you tried using different frosting flavors? I have not yet personally tried other frosting flavors – this recipe really was on the fly using ingredients I already had in the pantry. But I am 99.9% sure you can use whatever frosting/chip combination you want. I will be doing some more experimenting after the holidays and after my bronchitis clears up for sure! This looks like the easiest dessert recipe ever. Unfortunately my family are not huge chocolate lovers. What is your opinion re: whether this could be done with like peanut butter chips (but then what flavor frosting, I wonder…) or any other flavors/ingredients? Hey Kate I totally get that Chocolate is not everyone’s thing. I am going to be trying some other flavor combinations in the next few weeks. But I am pretty sure you can use whatever flavored frosting and chips that you like. One of my friends said she makes it with white chocolate chips and strawberry frosting. So yeah that should work! I love you Heidi, you just saved me me hours of having to make fudge cake pops. I was going to surprise my son and his co-workers with that but I think this will be easier and yummier! Awesome Tracy! We are all about helping folks save some time! Does this fudge need to remain refrigerated after it is made? Hi Kim, thanks for dropping by. It does not need to stay refrigerated. I just put it in the fridge to chill it quicker so I could get it cut and packaged up. It should be OK for about 1 week at room temp. But for longer storage toss it in the fridge. Just wondering all the bags of chips I buy come either 6 or 12 oz. Would using the entire 12 oz bag screw up the recipe? The bag of chocolate chips I used is noted in the recipe – 10 oz bag. You can see the oz size on the bag in one of the pictures. The reason the bag of chips in the picture has only 10 ounces is because they are dark chocolate chips. (Milk chocolate chips also come in 10 oz bags.) Semi-sweet chips come in 6 oz and 12 oz bags. You’ll need about 1 2/3 C semi-sweet chips to equal 10 oz. I was going to try cream cheese frosting with the chocolate chips. Sounds yummy to me! That sounds great Judy! Let us know how it turns out! Does this fudge come out “hard” or “gooey”? Most fudge is a bit to gooey for my taste, I like it hard, sugary, almost crumbly. I would say that this fudge is neither hard nor gooey. I have had super gooey fudge and some super crumbly fudge as well and I would not say this is either. It is hard yet a little soft in texture.